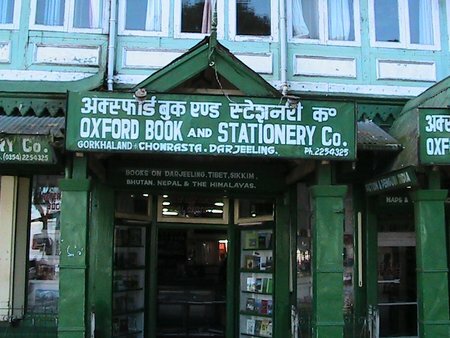 Oxford Book and Stationery Co. has been one of the most favorite landmarks of Darjeeling for over 60 years. Located at the Mall, the book store which is built in a typical hill style architecture of fretwork and pitched roof, always provides a familiar and welcoming face to the locals and visitors. The store is located at the ground level. If you look above, you will see The Chalet hotel which is also one of the old hotels in the hill town. As you enter Oxford Book store, you will see several attendants, one of who will approach you to help you with the books that you may be looking for. Or you can choose to be on your own for hours scanning the vast collections of books at the store. 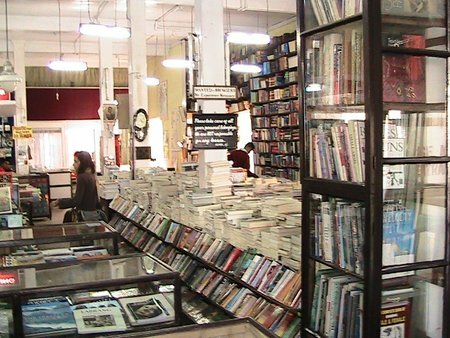 The store specializes in books on Darjeeling, Tibet, Bhutan, Sikkim, Nepal and the Himalayas. When I started my research on Darjeeling and decided to explore the hills, this is where I started from. When I asked for books on Darjeeling, the smiling attendant at the store looked at me for a while and asked me "What sort of books?". I told him that I was looking for books on Darjeeling tourism, maps, history, culture etc. I was almost horrified when I saw the man started piling up books making a mountain and went on doing it until I asked him to stop. Yes such is the collection of this book store in Darjeeling. On the contrary, in College Street of Kolkata I scanned all the major book stores only to find two or three books on the same subject, some of which were written over 100 years back and completely outdated. Oxford, a popular rendezvous for readers and shoppers is owned by Mrs. Maya Primlani who has been running it with grace and charm over the years. They can also arrange to send the books that you order by parcel to all over the world. As you enter the store, you will also see a children's section. Strangely there is also a section at the end that sells Darjeeling Tea in packets. So tea in a book store indicates the popularity of the product here. You will see Lepchu, pure green tea and other different types which they get from the Nathmulls. There are valuable books giving information about tea as well. As you approach the Chowrasta Mall from Nehru Road, Oxford Book Store is right in front at the Mall and on the right of Habeeb Mullick and Sons. Thank you for the review on Oxford Bookstore. I recently visited it on 13th June and it was a pleasurable experience. The staff were friendly and well informed and most importantly, there were so many books to choose from. Even though I traveled light and didn't shop at all, I could not help buying 4 books on Sikkim and Darjeeling. The tea counter at the far end near the cash counter is a boon for those who would love to pick up gifts of Darjeeling tea, the best gift out of the hill station. I hope and pray Oxford continues to operate for many many years to come so that all those who visit the Mall derive as much pleasure as we did.